First, identify each of the following famous opening passages, then check your answers using the answer key below. Next, translate each passage, then compare your versions with the corresponding extant translations below. 16. “One day in August a man disappeared. He had simply set out for the seashore on a holiday, scarcely half a day away by train, and nothing more was ever heard of him. Investigation by the police and inquiries in the newspapers had both proved fruitless.” (Saunders, The Woman in the Dunes, 1962). For the sources and extant translations, click here. Word has it she was straddling an elephant just the day before last. Nagai Kafū's (1879-1959) story takes place within one cycle of the calendar, and most of it is centered around the four seasonal fushime, or periods of seasonal transition. This fact is significant because the work as a whole can be seen as a meditation on transitions, not only of the seasonal type, but of personal transitions from youthful innocence to the realm of experience, or of the larger, more turbulent historical transitions from the pre-Westernized culture to the new modern Meiji state. The story begins at the fushime between late summer and early autumn, and it finishes in the early stage of summer. Kafū makes no claim to originality of plot. In fact, the story seems to be taken straight from your standard love story of the Edo theater, or from the collected works of Higuchi Ichiyō. Kafū’s innovation lies rather in how he refashions the story into a kind of anti-bunmeikaika novel, and in how he imaginatively reconstructs the rapidly vanishing culture of old Edo. Ch. 1- Ragetsu, teacher of poetry, wanders to sister's house at night, half-drunk. Background on his disinheritance. Ch. 2-7: The Story of Chōkichi and O-ito. Ch. 2- Chōkichi, 17, waits on bridge for O-ito, 15. O-ito finally arrives, informs him of her new profession. Ch. 3- Autumn. Chōkichi is despondent, wanders streets, stalks O-ito. Ch. 4- Chōkichi's troubles worsen. Ch. 5- Early December. Chōkichi encounters a transformed O-ito. Ch. 6-7- The theater world of Miyatoza. Chōkichi meets with old friend Kichi, who is now an actor. Ch. 8: O-toyo meets with Ragetsu to discuss Chōkichi. Ragetsu, against his better intuition, sides with O-toyo. O-toyo takes omens from an Asakusa temple. Ch. 10: Beginning of summer. Melodramatic ending. Senzoku and Yoshiwara are underwater. Ragetsu visits sister, finds Chōkichi ill with typhoid fever, watches house while Chōkichi is taken to the hospital. Snoops about house, finds letter. Realizes that Chōkichi might have attempted suicide after losing O-ito and being advised not to become an actor. Ragetsu regrets the advice he gave the boy, and vows never again to betray the boy. First, let me briefly define the two conflicting social spheres depicted in the story. The driving idea behind the Meiji period was modernization, which sought the creation of a westernized, industrial-capitalist nation-state. The center for this new nation-state was, of course, Tokyo, particularly the “high-city” regions surrounding and west of the Tokyo castle. The stated goal of the nation was bunmeikaika, or “cultural enlightenment,” and risshin shussei, or “self-realization and social enhancement,” was the personal goal of much of its citizenry. Ambition and respectability were highly valued; inefficiency and backwardness – including the perceived “backwardness” of the old plebeian culture – were deplored. It is these modern materialist values that dominant the harsh, competitive, and egocentric world that Sanshirō and Hirota-sensei inhabit in Sōseki’s Sanshirō (1908). However, in Nagai Kafū’s story "The River Sumida," the older way of life can still be found in certain pockets of the low city near the river. Located around the Sumida River and Edo Bay, Kafū’s shitamachi culture was, in contrast to the top-down ideology of Meiji modernization, an amalgam of residual cultural inclinations that were developed and cultivated by the non-elite merchant class. Soon after the Meiji Restoration, the old “vulgar” arts born along these banks came to offer a kind of refuge – especially for Edo elegists such as Nagai Kafū – from the new capitalist ethic. Profligacy and aestheticism – the kind represented in Sumidagawa’s main character Ragetsu – together offered the possibility of resistance to official ideology. As Jinnai Hidenobu points out in Chapter Two of Tokyo: A Spatial Anthropology (Tokyo kūkan jinruigaku in the original), in the early Edo period sacred places of worship developed not around the city’s center – as was the case in Europe – but in areas removed from the major centers of activity. In the high lands of early Edo, temples were built along the edges of hills, with the woods in the background; in the low city, the temples were set apart from the centers of town, and “jutted toward the water’s edge” (Jinnai, 87). Set apart, these sacred hubs served as a temporary escape from the commercial and personal attachments of the city, and they attracted a motley host of characters ranging from itinerant priests and nuns to musicians, entertainers, and, after the areas had evolved into akusho (or “places of ill-repute”), prostitutes and their customers. In such places, the sacred and the profane had always been inextricably linked, as both the pious pilgrim and the lustful young dandy sought different forms of what was essentially the same thing – escape from the quotidian and the attachments of the city. This aspect of the city is the focus of Kafū’s Sumidagawa, though not from the perspective of either pilgrim or dandy. Instead, the work is centered on a former kōshoku otoko (or “amorous man”) who has somewhat settled down, and a young boy who is torn between the high-city and low-city ideologies. Interestingly, the high city – the city’s political center – is barely even mentioned in the work, as all the action revolves instead around the Sumida River, where, in addition to worldly men of taste like Ragetsu, "sinister-looking men" gather around Asakusa Temple (193) and "evil-eyed rickshawmen loiter about" (202). “For these 'medievalists,' as the architectural historian Takashi Hasegawa has called them, the appeal of the Edo landscape was essentially pictorial, as framed in the prints of Hiroshige or Kobayashi Kiyochika (1877-1915)" (33). The young, brooding Chōkichi too seeks refuge in these pictorial corners of the city, as evidenced by his numerous wanderings around these neighborhoods. During one such brood, he happens upon the address of the fictional Tanjirō of Tamenaga Shunsui's Calender of Plum Blossoms. "How he wished that he could have lived just such a life. . . The dreams spread their wings, the blue sky was bluer and higher. From the distance came the sound of a confectioner's flute. The weird, low strain, unexpected in these back streets, added a touch of sadness, mysterious and quite beyond description. . . . For a time Chōkichi forgot his dissatisfaction with his uncle. For a time he forgot the anguish of reality" (215). Risking oversimplification, I think it might be possible to see each of the story’s characters in terms of their identification with either of two cultural spheres. Ragetsu and Chōkichi most obviously represent the newly marginalized Edo plebeian culture, while O-toyo, though a teacher of “vulgar music,” is clearly on the Meiji side of the ideological divide. 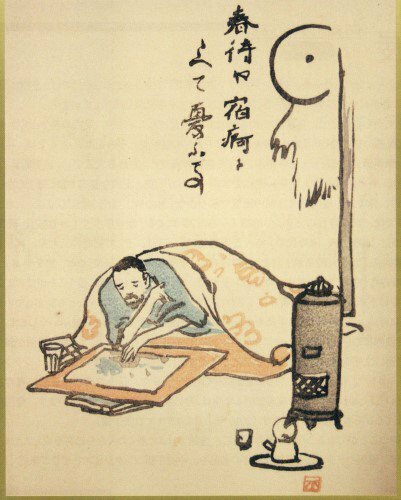 Shōfūan Ragetsu, the disinherited poet-profligate who teaches the composition of haikai poetry for a living, is the story’s hero. Roaming the night streets half-drunk, and stealing the occasional peep at the women bathing behind the fences, Ragetsu is a far cry from the model Meiji citizen of the day. Though once heir to a pawnshop in Koishikawa, he has been disinherited by his family for refusing to renounce his degenerate ways, and, although married (to a former prominent geisha), he and his wife are childless. But more importantly, it is above all his knowledge of and fondness for the old Edo art forms, along with his vow of loyalty to the boy at the end of the story – " . . . there would have been no point to it unless he helped Chōkichi become an actor, and brought him and O-ito together. The name of Shōfūan Ragetsu, master of poetry, man of the world, had been shamed" (217) – that place him firmly in the shitamachi camp. For Nagai Kafū, it is exactly this figure of the profligate-scholar who serves as the perfect apparatus for critic of modernity, for he is, like the more intellectual Ōgaiian bōkansha (or “bystander”), also a kind of bystander who is close enough to the world to observe in detail the vanities and the desires that drive the age, yet who is distant enough to see beyond it, to a kind of eternal backdrop -- a kind of mono no aware -- that lies behind things. Such a brief but evocative vision comes in the first chapter after Ragetsu arrives at his sister’s house in Imado. “Not quite sober yet, he would from time to time hum a strain of the ballad to himself. Then, his eyes closed, he would let out an unrestrained belch, and, swaying from side to side, glance over at his sister. She was in her forties, and the sad light of the lamp made the emaciated little figure look yet older. And she had once been the pretty, pampered daughter of a successful pawnbroker – the thought did not fill Ragetsu with nostalgia or sorrow or any other mood akin to reality. No, it took him beyond such feelings, and made him think only how very strange it all was. He had been young and handsome in those days himself. He had been popular with the ladies, and he had had his good times, and finally he had been disinherited for all of the seven lives to come. . . . [These memories] would stay in his memory and O-toyo’s as long as the two of them lived, and then one day he and his sister would be gone as well, and so the others would vanish like smoke” (184). In Chapter 7, Chōkichi, torn between the desire to become an actor and the duty to fulfill his mother's dream for him to become an official, sits down at Tōshōgū shrine to mull over his fate. Here he begins to perceive the existence of two distinct worlds – the exciting world of the theater, on the one hand, and the harsh world of contemporary Meiji Japan, on the other -- and realizes for the first time which side he is drawn to, and which side those around him are on. "He compared the ways of the two women, the respectable one who was his mother, and the other, the woman with the past. And he compared the sort of person he had teaching him in school with the sort of person his uncle was" (198). Other characters on the Shitamachi side of the divide include Kichi, the barber's son and old friend of Chōkichi, who has become an actor in a popular theater troupe, and now goes by the name “Tamamizu Saburō.” There is also the daughter of the pastry shop, O-ito, who is Chōkichi’s longtime friend, but who since beginning her geisha career has developed into quite the sophisticated little 15-year old lady, who has little time for the boyish Chōkichi. There is also the Yoshichō lady who recruits O-ito into the Shitamachi pleasure quarters. There is also Otaki, Ragetsu’s wife, who was once a top mistress at the Yoshiwara house. It is significant that she is contemptuously referred to as the “aunt from Koume” by O-toyo, who is on the other side of the divide. And finally, there is the third person narrator, who closely identifies with both Ragetsu and Chōkichi, yet who is not altogether unsympathetic toward O-toyo's sacrifices for the sake of her son. On the other side, there are those characters who represent in one form or another the modern Meiji state and its bureaucracy. These include most prominently Ragetsu’s sister, O-toyo, who, despite between a "teacher of vulgar music" (211), clearly belongs in this category, as she will apparently stop at nothing to see her son Chōkichi leave the old Edo world and enter the elite ranks of Tokyo, even if it costs her everything in the process. Other characters that identify with this ethos include O-toyo's husband (who died soon after inheriting the failing business "Sagamiya"), O-ito's father (the deceased carpenter), O-ito's mother, Ragetsu’s dead father (who owned and ran the pawnshop "Sagamiya" in Koishikawa), and the "typical Meiji gentleman" who are the imagined future customers of O-ito (191). “Nagai Kafū’s (1879-1959) The River Sumida (Sumidagawa, 1909) is the story of a year in the life of Chōkichi, a seventeen-year-old boy torn between his obligation to his mother to finish school and his longing to be part of the world of the traditional theater. Most of the events of the story occur during the four seasonal fushime, or periods of seasonal transition. This fact is significant because the work as a whole can be seen as a meditation on transitions, not only of the seasonal type, but of personal transitions from youthful innocence to the realm of experience, as well as of the larger, more turbulent historical transition from the traditional culture of the Edo period to the “civilization and enlightenment” (bunmei kaika) of the modern Meiji period. The story begins at the fushime between late summer and early autumn, and finishes in the early stage of summer.” –Mabel Callahan, a previous post. Provide a short description/definition of the following terms. (Note: I have already begun to fill out some of them for you.) Also, spend a day walking around the Shitamachi downtown region of Tokyo (e.g. Asakusa, Sumidagawa, etc. ), locating as many of the places mentioned in the work as possible. 2. Asakusa 浅草: Center of the old shitamachi (downtown), and the major entertainment district of Tokyo until the Taishō period. The area is also known for its various Buddhist temples, the most famous of which is the Sensōji, which is dedicated to the bodhisattva Kannon. 7. Azuma Bridge吾妻橋: “swarming with people” (210). 10. Matchi Hill (Matsuchiyama) 待乳山: Hill above Asakusa. 11. Imado Hachiman-gū 今戸八幡宮: In the story, where the New Year’s festivities are held. 12. Komagome 駒込: Where Rankichi’s father is currently buried. 13. Yanaka 谷中: Possible new site for burial. 14. Koishikawa 小石川: Site of the Sagamiya pawn shop. 15. Yoshichō芳町: Geisha house where O-ito is to be employed. 21. Jikatamachi 地方町: Where O-ito and Chōkichi were grammar school students together. 22. Miyatoza Theater宮戸座: “Regarded by aficionados as the last holdout of Edo-period Kabuki, the theatre was still in business during the Taisho period, though by then it was competing with music halls and motion picture palaces” (Mansfield, Tokyo: A Cultural History, 121). 23. Hashiba 羽柴: The lady who notices O-ito’s beauty is from Hashiba. 24. Matsubaya 松林: Location of the geisha house where O-ito now works. 25. Kaminarimon雷門 (Thunder Gate): The first of two large torii-style gates leading to the Sensōji in Asakusa. First built in the seventh century, it has long since been the symbol of Asakusa. The rokku or “Sixth District” was in particular famous as a theater district, featuring famous cinemas such as the Denkikan. 29. Asakusa Bridge浅草橋: In the stalker chapter, Chōkichi wanders from Komagata to Kuramae to Asakusabashi to Bakurochō (194). 30. Meiji Theater明治座: Theater in Nihonbashi. First constructed in 1873. 33. Tōshōgū Shrine東照宮: The shrine where Chōkichi meditates. 34. Dōryōji Temple: Where Rangetsu buys a jar of sweets. 36. Shintomiza Theater新富座: Also known as the Morita-za 森田座 (or 守田座). One of the major Kabuki theaters of the Edo period. Destroyed in the 1923 earthquake. Located in the Kobiki-chō district of Edo. During the early twentieth century, Ii Yōhō’s (1871-1932) troupe often performed here. 37. Ryūganji 了願寺: Temple in Kameido. Chōkichi and Ragetsu walk during their chat. 43. Tokiwazu School 常磐: Tokiwazu-bushi is generally abbreviated as “Tokiwazu.” Tokiwazu is a school of Jōruri, and originated in Bungo-bushi, founded by Miyakoji Bungonojo. In Kabuki, Tokiwazu is mainly responsible for Degatari (onstage performance) as the accompaniment for Buyō (dance). Tokiwazu group consists of reciters called Tayū, and Shamisenkata (shamisen players). The shamisen used are chuzao (medium-neck). The distinction of Tokiwazu-bushi is that it is slower-paced and more solemn than Kiyomoto music. 44. Ballad of Koina and Hanbei (Koina Hanbei mono 小いな半兵衛物): “A story of violent but steadfast love between a geisha and a man of the merchant class. It is to be found in several schools of Edo balladry, including Tokiwazu” (Seidensticker’s note). 45. Spring Colors: A Plum Calendar (Shunshoku umegoyomi 春色梅暦): A ninjōbon written by Tamenaga Shunsui between 1832 and 1833. 47. 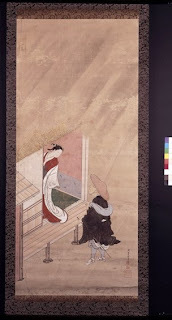 The Love of Izayoi and Seishin (十六夜清心): A (failed) love suicide play written by Kawatake Mokuami (1816-1893) in 1859, included in Kosode Soga Azami no ironui 小袖曽我薊色縫). The play is about Seishin, a Buddhist monk, and the courtesan Izayoi, who in the end tragically take their own lives. In Kafū’s story, the play is performed by theater group at Miyatoza. The scene where Chōkichi is waiting for O-ito is echoed in the play (204: “The singers took up again. . .”). The play is also known as Satomoyou azumi no ironui (four-part Kizewamono style play). For an English translation, see Love of Izayoi and Seishin, a Kabuki Play, translated by Frank T. Motofuji (1966). 50. Dōjōji道成寺: Nō play; also, the type of dance that is performed by O-ito in the Sanja festival (189). 53. Kiyomoto 清元: A style of narrative music, originating in the Tomimoto style, and created by Kiyomoto Enjudayū I in 1814. Answer six of the following questions. I expect at least one full paragraph for each answer. 1. Citing specific passages that support your claim, describe the mood of the work. 2. Describe the narrative structure of the work (i.e. the narrative perspective, voice, focalization point(s), use of showing vs. telling, etc.). 3. Consider the passages in the work that describe the Sumida River and its vicinity. How do each of these passages relate to the story? Why do you think Kafū decided to include so much non-plot-essential description? 4. Describe the personalities/perspectives/worldviews of the four major characters of the work (Chōkichi, Rangetsu, O-toyo, and O-ito). 5. Describe the two rival worldviews that are presented in the work. Which worldview is each character associated with? Which worldview do you think the author is more sympathetic toward? 6. Can this work be read as an example of “a critique of civilization” (bunmei hihyō), or even “resistance literature” (teikō bungaku)? Explain your answer. 7. Note the passage of time in the work. How does each episode relate to its seasonal setting? 8. Discuss the relationship (past and present) between Chōkichi and O-ito. 9. Explain the significance of the theater scene. What effect does the play have on the heartbroken Chōkichi? How does the play mirror what he is going through? 10. Discuss Kichi’s role and significance in the story. 11. How does Rangetsu handle the delicate situation regarding Chōkichi? Why does he later regret the advice he gave to the boy? 12. Locate the passages that contrast a beautiful/idealized past with a degraded/ugly present. Discuss the significance of these passages in relation to the two worldviews that are presented in the work. 13. What do you think will happen to Chōkichi? Do you think that he—with Rangetsu’s assistance—will go on to live the life he longs for? Explain your answer.